The Feather River Route. Operated the famous California Zephyr. 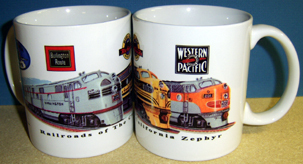 Products bearing individual marks are licensed marks owned by Union Pacific Railroad Company and are used under an active license agreement. 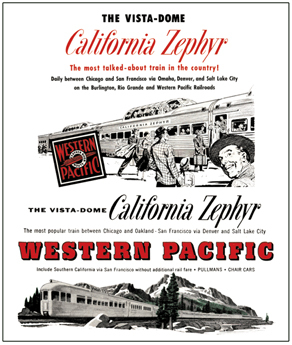 Beautiful advertisement ran by the Western Pacific Railroad in the 1950s, promoting its portion of the world famous California Zephyr. 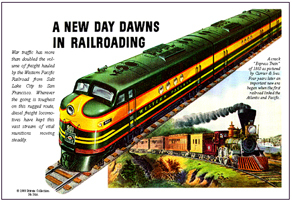 One of the most famous diesels in railroading, the EMC FT is featured in this ad covering the Western Pacific Railroads very first FT diesels in their as delivered early WP paint scheme. 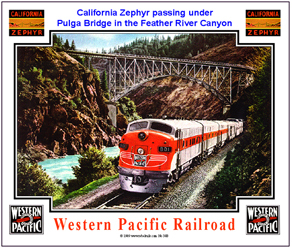 The world famous transcontinental California Zephyr passenger train rolling under the Pulga Bridge over the Feather River Canyon. 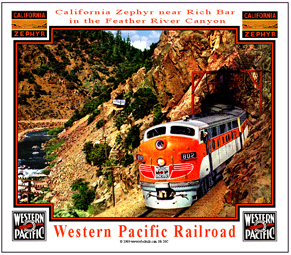 The world famous transcontinental California Zephyr passenger train rolling through Rich Bar in a beautiful scene. 6 inch x 6 inch square tin Feather River Route logo sign of the Western Pacific Railroad. 6 inch x 6 inch square tin logo sign of the Western Pacific Railroads Scenic Limited passenger train. A very rare sign today.